By lavender at May. 27. 2017. Monarda punctata L. Spotted bee balm, horsemint or Monarda punctata L. call it what you will but by any name it in an interesting addition to the garden. I picked mine up as a seedling at the Shaver’s Creek native plant sale. I wasn’t really expecting to see it this year as it is usually used as an annual. It is listed as a short lived perennial, not lasting for more than 2-3 years, or as a biennial. While it is hardy to -35 degrees F. it doesn’t seem to come back in the spring. The first one I tried never returned. This little seedling to my surprise did indeed return and has achieved a nice size. It is about 2 feet tall and 20 inches across. The plant’s maximum size is 3 feet by 3 feet. It is supposed to be a somewhat woody plant but mine is more herbaceous and the abundant flower heads have made it floppy. It may take several years to achieve a sturdier structure if it returns. Spotted bee balm is a native plant. Its range is from Vermont to Minnesota and south to Florida in the eastern part of the United States and in the eastern part of Texas and Mexico. It is also native to eastern Canada and parts of California. As it moves west and south it becomes a number of varieties of the subspecies. Its preferred habitat is old fields, meadows, pastures, prairies and savannahs. It can also be found in thinly wooded areas, roadsides and other disturbed areas. It is partial to sandy soils and well drained areas but will grow in garden soil. It will grow in full sun to partial shade. There are a number of reasons to grow this plant. It is a somewhat unusual plant and makes a good filler in a perennial border or other planting. It can also be used as a ground cover in a limited capacity. It serves a similar purpose to lamb’s ears in the garden. This monarda is not grown for its flowers. They are small, tubular shaped and circle the stem in a whorled configuration. Their color is yellow with purple spots. 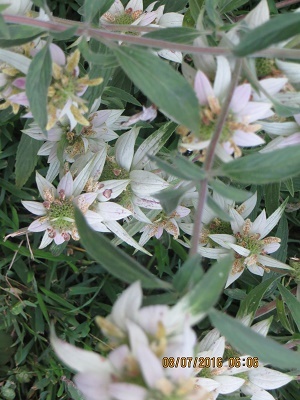 They are enclosed in colorful bracts which are the main attraction of spotted bee balm. The bracts can be purple, pink, yellow or white. They start out the deeper color, early in the plant’s blooming season, and gradually fade to a paler color or white. The bracts persist long after the flowers have been pollinated and start to produce seed. Thus the “flowering” season can persist over several months. They flower in July through August in our area. The bracts make a nice color show and then fade to a background for late blooming perennials such as black-eyed- Susan and purple cone flowers. Monarda punctata is extremely attractive to all sorts of insects, butterflies and humming birds. Planted around a vegetable garden it attracts a number of different kinds of bees including honey bees, native American bees and bumble bees. It also draws the golden digger wasp (Sphex ichneumoneus), a non-aggressive wasp, that feeds its larvae on crickets and grasshoppers. Our charming hummingbird moth ((Macroglossum stellatarum) also finds it attractive. Various butterflies, moths and skippers use it as a nectar source. One of these is the endangered Karner Blue (Lycaenides melissa samuelis.) It is also a host plant for a number of butterflies and moths including the Southern Purple Mint Mouth (Pyrausta laticlavia) and the Raspberry Pyrausta ( Pyrausta signatalis.) While attractive to insect life it is shunned by the herbivores that graze through the garden. Spotted bee balm resembles oregano in odor, and like most mints and strongly aromatic plants, is not eaten by deer, groundhogs or rabbits. This Monarda has a higher thymol content than any of the other mints. This is one of the two active medicinal ingredients in the plant. The other is carvacrol. Both are powerful antibacterial agents, as well as fungicides. Studies have shown that both lower the ability of bacteria to resist antibiotics. Both also prevent the breakdown of acetylcholine, which is one of the symptoms of Alzheimer Disease. There are ongoing studies in this area. Herbalists recommend a tea for upper respiratory ailments. It can also be used for nausea and digestive problems. A poultice or salve made of an extract of the leave draws blood to a given area and may be helpful for aching muscles and arthritic joints. As the name horsemint suggests you can also use it to treat your equine friends. The plant can be propagated from cuttings of new growth or from seed. It should grow from seed that is not stratified but fall planting is advised if planting outdoors. The plant is said to readily reseed itself but since it prefers sandy soil if may or may not reseed readily in our heavier clay soil. Perhaps preparing a sandy bed in the fall might be the best way to germinate the seed. This advice comes from a curious occurrence with the seeds of baptisia. I grow 3 different varieties of this plant and have never had a seedling. There is one currently thriving in one of our beds that has produced seedlings. It is growing in the worst possible soil under horrendous conditions and the seeds are germinating. But I digress. I will probably have some of this seed in the fall and perhaps some plants in the spring. Add it to your pollinator or butterfly garden as a nice complement to the other Monardas.